Choose a category or use a quick link to see more posts. It is hard to say. Are slowly being taken away. When I enter the room. When the greyness of Winter will disappear. Is spotty and I need to restore. As I see purple Hyacinth and Daffodil. Bring a few unkind words to my lips. Maybe the most beautiful of all. What is it like to "Run Amok"? Can I walk or drive a truck? Leave me alone and let me be. Being part of our history? Even if it's not what you choose? You don't volunteer for history. Is coming from someone so near. The tears on my cheeks, are real. You're a Big Boy and don't be heard. There's no one there, no one around. Will soon only be up in the Stars. as the Sunlight does wane. down the street, so happily. All with a different face. Just stand tall as your life will begin. How bright the Moon, peeking through the trees. A radiant bright, light to my eyes, does appease. No noise from the Moon, just pure delight. Is to bring you no more sorrow. W.H. Auden, (1907 – 1973) English-American poet. He exerted a major influence on the poetry of the 20th century. Auden’s first book of poetry, "Poems", was published in 1928. 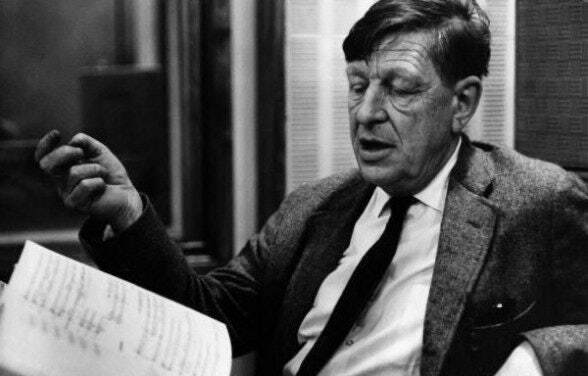 Auden won the Pulitzer Prize in 1948 for "The Age of Anxiety". Much of his poetry is concerned with moral issues and evidences a strong political, social, and psychological context.